The temperate rain forests of the West Coast of Canada are magnificent to behold. You could say that forests are our sacred groves. In a young and secular country with a small population and vast expanses of pristine wilderness, our forests are our natural temples. This is where we go to worship the beauty and majesty of nature, and what attracts many of our visitors. But you don’t have to be a rugged explorer to appreciate our northern paradise. 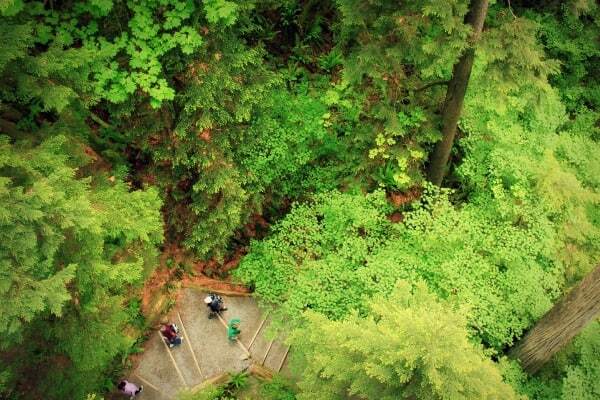 The West Coast temperate rainforest can be found lovingly preserved at Capilano Suspension Bridge Park. 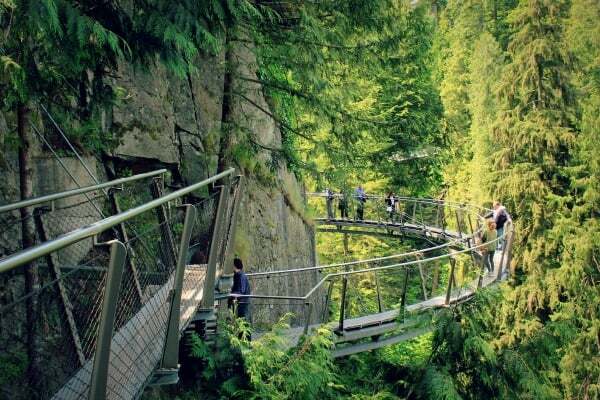 Just a short drive across the famous Lion’s Gate Bridge from downtown Vancouver, and located in a well-to-do suburb, 27-acre Capilano Park is truly a delight and well worth the visit. The park is 125 years old, and has a rich and interesting history with interwoven strands of both Native and immigrant cultures, all of which are particularly well displayed. But what I enjoyed most was the atmosphere and the natural environment. 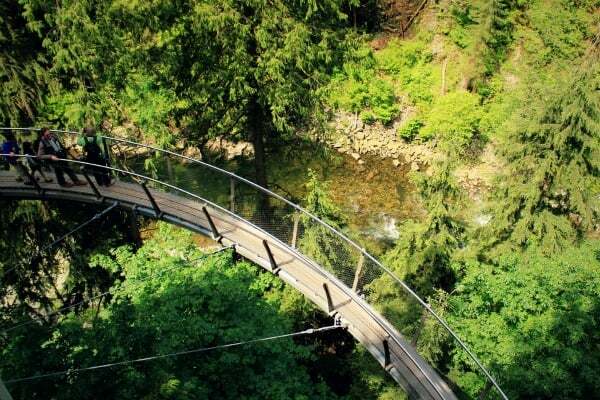 For, though Capilano Suspension Bridge Park is a tourist attraction, it is a rare one. 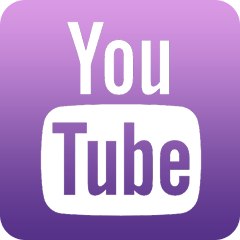 It actually preserves the special ambiance of the natural environment, while making it accessible with displays, signage, interactive exhibits and nature and history tours. As you walk softly on a thick carpet of reddish pine needles you feel enveloped by the lushness, moist air and sun-dappled greenery. Iridescent ferns, bright mosses, and trickling streams of fresh water catch your eye at ground level. Crowds of evergreens — cedar, pine and fir trees — soften the middle distance. And majestic Douglas Firs thrust upwards, ram-rod straight, creating a lofty canopy. 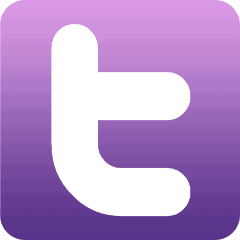 Birds twitter among the branches, while squirrels gambol up and down tree trunks and butterflies alight on lush ground-level foliage. There is a quiet sanctity, a reverence in the air that slows the gait and lowers the voices of casual visitors. Up in the trees on the Treetops Adventure. I met a couple from Kerala, both biologists, who were very enthusiastic about the park and about the new and different species they were encountering. Like me, they felt they truly were in the forest — a slice of forest well managed, maintained and easy to explore. Capilano is an especially interesting destination for families and foreigners, I think, because there are so many opportunities to experience and learn about the natural environment in this part of the world. Elders can stroll the well-maintained paths while kids can climb up to the Treetops adventure and along the Cliffwalk. In fact, I met several families from India at the park, all three generations enjoying different activities. A family from Gurgaon told me they loved the warm people, the nature and greenery of British Columbia, and that “people are not in a rush.” Families from Bombay and Gujurat told me they loved the freshness and cleanliness. A Chief Joe Capilano exhibit at the Story Centre. 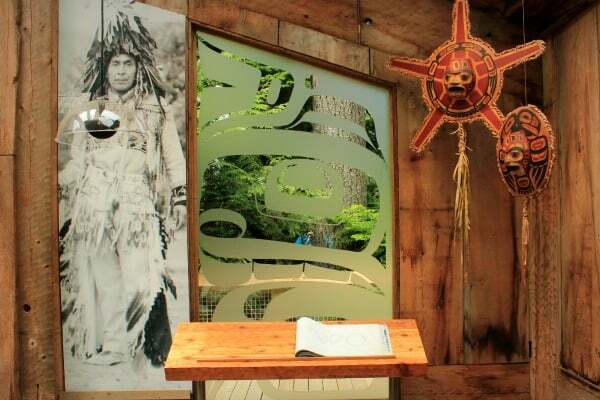 The first thing I did after reaching Capilano was walk slowly through the Story Centre, a well-produced and interactive pathway designed to teach you about the park’s history, in an entertaining manner. I learned that in 1888, a Scottish engineer named George Grant Mackay bought 6,000 acres along the Capilano river and built the first suspension bridge. A sturdier bridge replaced the original, and the site became a tourist attraction in the 1920s and 30s. In 1953, a new owner, Rae Mitchell, built the current bridge, developed the park and aggressively promoted it. His daughter, Nancy Stibbard, spent about 10 years (from 1983-1993) working on the park to bring it up to the high standard you see today. I also learned there was indeed a connection with the Native people of this area. 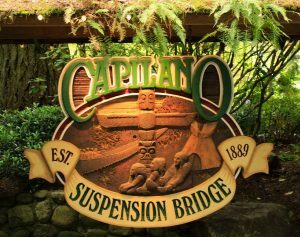 In fact, the word Capilano is derived from Kia’palano, a Squamish word for “beautiful river.” And Chief Joe Matthias Kia’palano was hired in the 1930s to tell stories and teach visitors about the Native way of life. Some of the many Story Poles at Capilano, each with their own story. More recently, in the 1980s, local Native artist Wayne Carlick was hired to create most of the Story Poles (often referred to as “totem poles”) you see around the property. Each is carved from a single cedar log and each tells a story through symbolism and imagery. My guide, Alex, told me the story of his favourite pole — all about how all the light of the world was held within a box until the chief saw that his daughter was beautiful, and released the light. Alex is a history tour guide, an anthropology student who knows a lot about Native art and culture. 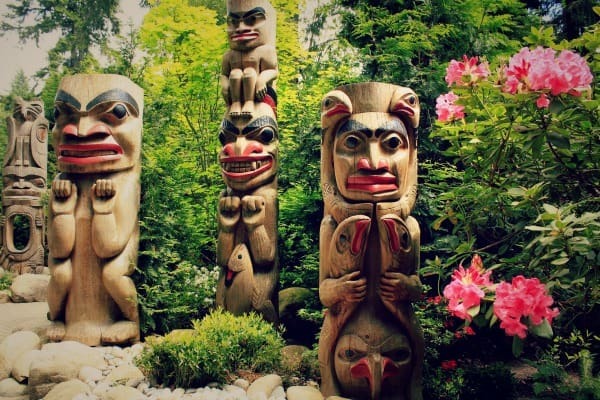 The Story Centre and Story Poles are located on the east side of the Capilano river, along with a cafe, restaurant, the Trading Post store and the Cliffwalk. This is the park’s newest and most impressive attraction: a cantilevered walkway clinging to the granite cliff high above Capilano Canyon. 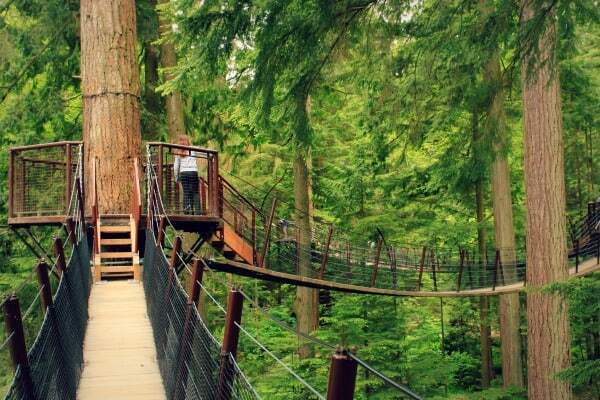 It really is a marvel, and like just about everything else at Capilano Suspension Bridge Park, built with sustainability and the environment in mind. Only one tree was cut down to make it and all the materials used are renewable. In fact, it was built off-site to lower the impact on the fragile environment. In the rain forest canopy, looking towards the forest floor. 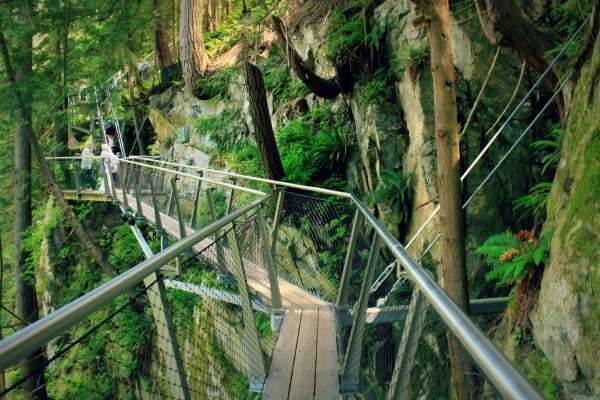 Walking among the canopy in the Treetops Adventure or suspended over the canyon on the Cliffwalk gives you a unique and special perspective on the forest. You can see it bursting with life at every level. Sun shining on the tips of evergreen trees make them look like intricate stained-glass designs. Water in the river far below sparkles and sings as it burbles over the rocks. A large bird with a wide wingspan soars over head, seemingly in slow motion. It is like being in a living temple, and it makes you feel part of the whole, part of the oneness that pervades all. The Cliffwalk is a sustainable and low impact activity. I was truly impressed with this park, which preserves and displays the natural environment using taste and sensitivity. 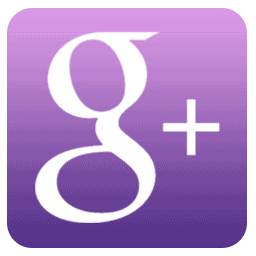 It’s spotlessly clean, well-maintained, very comfortable and offers visitors an astounding array of options. 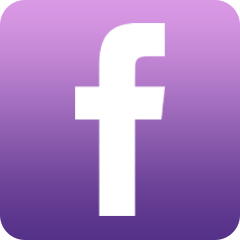 If you just want to eat and shop, you will find top-quality, local items for sale. If you want to dive into the forest and soak up the natural environment, who will find long trails winding through the woods. 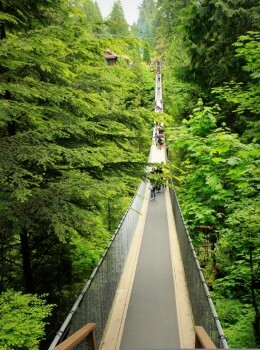 If you want some thrills, the suspension bridge and Cliffwalk will give you an eagle’s eye view of the river, way below. If you want to learn about nature, history or culture, you can join the guided tours. There is something for everyone here. And long after you leave, if you are like me, you will remember how you felt surrounded by the majesty of nature, and by people who actually really care.